In the year 2001, GW Plastics was looking for a reliable email server to replace their unstable system. Additionally, they were expanding to offices across the country and needed support. We provided and provisioned an MS Exchange server version 2000. For an additional six years, we provided strategic leadership and assistance with network server management. This assistance also included installation and configuration of Microsoft ISA software-based firewall application that was used to create PPTP WAN links from Bethel Vermont to their branch offices in Queretaro Mexico, Tucson Arizona, and San Antonio Texas. 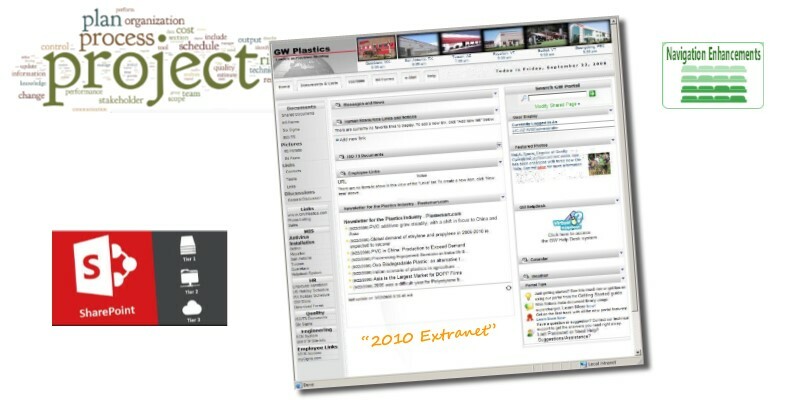 To assist GW's internal collaboration and communication we worked together on the design and development of a SharePoint-based intranet. It was a privilege to work with Dustin Tabor, GW's network superstar, and a very versatile IT professional who has the combined skills of 6 typical people. One curious note is that we were also providing what was called "smart mail hosting" for email sanitation for numerous clients including GW. We have always been proud of our holistic approach to provide whatever technical assistance is needed for our clients. Our collaboration between our two firms was strategic in advancing GW's technological backbone which provided stability and growth for the firm. Our firm has been providing Microsoft SharePoint consulting services since the first version of SharePoint so contact us today!